In the furor of following Comet ISON, we’ve almost lost track of another fine, fuzzy fellow – Comet Lovejoy. Last we checked in on this comet during the first half of November, it had swelled to almost half a degree in diameter with a 2-degree-long tail. From a dark sky the comet was even bright enough to glimpse with the naked eye in moonlight. I’m here to tell you it’s still all of those things. With the moon out of the sky, I could see Lovejoy without difficulty with the naked eye near the star Gamma in the constellation Bootes below the handle of the Big Dipper early this morning. It looked like a small fuzzy blob of magnitude 4.6. 10×50 binoculars really did the comet justice. With them a beautiful, gossamer tail stretched across half the field of view or about 2.5 degrees. One degree is the amount of sky you can cover with your pinkie finger held at arm’s length. The photos closely match my visual impression of the tail through the 10x50s. 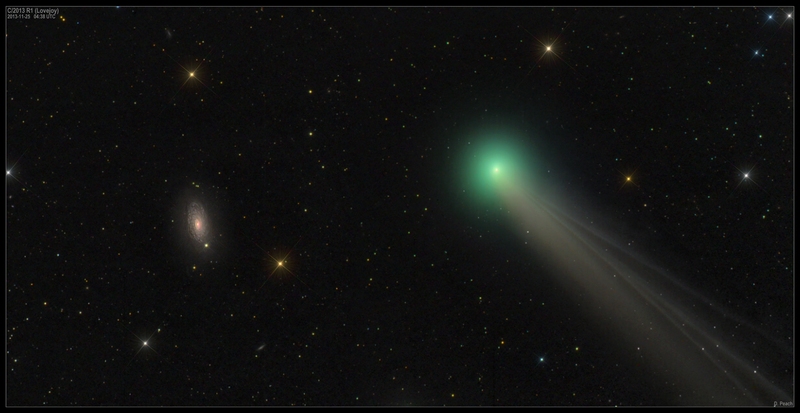 Through a 15-inch telescope at low magnification, Lovejoy’s monster-sized head (just under half a degree, the diameter of a full moon) glowed pale blue-green highlighted by a bright, fuzzy dot at its center – the false nucleus. The real comet nucleus always remains hidden in its wraps of dust and gas. Upping the magnification to 287x, a striking, funnel-shaped fan of dust issued from the false nucleus to the south-southeast. This feature has been a regular part of Lovejoy’s anatomy for at least the past few weeks. I urge observers with 6-inch and larger telescopes to take a look. This amazing jet of dusty material boiling off the comet’s nucleus won’t be visible forever. Use high power and bore right into the coma’s center. Comet Lovejoy clears the horizon around 1 a.m. (I know -ouch!) but you’ll see it best between 2:30 and the start of dawn when it’s better placed. The comet passed closest to Earth on Nov. 20 – that’s why it’s still bright. As it moves away from Earth it will gradually get dimmer, which makes the coming two moonless weeks the best time to seize the opportunity. It is rising later each night so it’s altitude in the morning will continue to drop as well. True, until its increasing distance (and slower movement eastward) is compensated by earlier rising times of the constellations it passes through. Comets have always been my favorite objects to follow. Ive been watching all these comets currently in the night sky since they started coming into view. Recently I wrote an article that was posted on Cloudy nights about seeing all 4 comets in one night. They are very fun to follow and take time, dedication and passion to follow closely. Ever clear night I can get out, I get out early in the morning and follow these comets and watch them change from night to night. Here’s my small write up on seeing all 4 comets in one night. It was pretty exciting. I do this whenever anything spectacular happens in the night sky!! I really enjoyed reading your story – thank you for the link! There’s nothing like that feeling of accomplishment and satisfaction in plotting and finding a comet – or in this case 4 comets! – on your own. I wholeheartedly agree that not only are comets beautiful to see, you can learn a lot and find great enjoyment in watching them evolve from little midges to full-fledged spectacles. I find interest in checking the ISON tracker. I do not know how accurate the brightness model is for now, but yesterday about this time, it was posted at magnitude -4.0. Now, the magnitude is down graded to near -0.4. John Bortle says that ISON may be behaving like Seki- Lines did in 1962. I’ve seen and photographed Lovejoy in three sessions: mid November at dawn, a few days ago in country with quarter Moon, and yesterday with thin crescent Moon but in city. Not the best conditions, but what weather and free time allowed. Of course all such backgrounds limited the tail’s length and contrast. However I too noticed in scope the fan-shaped feature and I confirm it’s present since weeks. Thanx for underlining that it will be visible for limited time. Yesterday I also used a camera with telelens on tracking mount, just like you did. It works great. Tracking mounts are a wonder. After polar alignment, you’re ready to go, though on cold nights it can be a bit tricky. I keep the battery pack in a warm place until I’m ready to start shooting. These were taken when it was -2 F (-19 C). The mount was very stiff when I was finished! The camera was actually on piggyback on the scope (and still without equatorial wedge). So you use the piggyback method. Mine is a separate small equatorial mount with a screw on top to attach the camera. Right now, it does not look real good for ISON. It has been called a fading ghost. Hopefully, it will surprise us once again. We really have to count on its rockets to reignite now. It looks like it will be little more than a faint cloud. Lovejoy., was Glorious last Nite Bob on my bluffs looking over the ocean as it was rising over Cape Cod Bay in Cedarville.My Vixen Newtonian- best views were @ 50X & 100X !. Fantastic Phil. Worth the early hour, wouldn’t you say? hey Phil. curious if it was naked-eye out there. i was at my mom’s in Hopedale MA but since Lovejoy was right beside a star that appeared slightly brighter, there was only one thing i could detect there with averted vision so probably not the comet. it is remarkable the difference a dark sky makes tho. where my mom lives i can see the Beehive naked-eye, especially averted. where i live no way, really, and Lovejoy doesn’t look as spectacular in 10×50 binos, whereas this AM i could clearly see the tail distinctly from the head, for the first time really. looked in the wrong place for Linear X1, so i wonder if i could have seen that. also saw Neptune for the 1st time in a long time last night, once again thx to dark skies rather than the somewhat washed-out ones i usually frequent. I know next to nothing about photography but how is it possible to be able to see M63 and the comet with such clarity? I would think something so far away (M63) would be blurry if focused on Lovejoy and vice versa. The comet and galaxy are both so far away they’re essentially at “infinity” and focus equally. Matter of fact, the moon and even earthly clouds are so far from an observer that they’re all in equally sharp focus in a camera. Differences in focus only become apparent when objects are relatively nearby. Hello Astro Bob, thanks for the great info and photos of comet Lovejoy. Do you know if it and/or ISON will be visible from the southern hemisphere? I live west of Sydney, Australia.. hard to find info on viewing for my location. Thank you! regards, Marg. You’re welcome – thanks! ISON will probably not be visible from your location, especially now that it’s faded so much. If you could see it – and no one on the ground has spotted it yet – it would be extremely low in morning twilight. After a few days, it will completely disappear for you, while rising higher and higher for northern hemisphere viewers. Of course it’s still an open question as to whether it will be bright enough even for northerners. We’re waiting with hope. Unfortunately, Comet Lovejoy won’t be visible from your latitude until sometime in early February when it will have faded to around mag. 10 or so in Ophiuchus. Been very cloudy here, so if you see it, please post your observation. Thanks! Thanks for saying Jane. We’re all hoping someone gets to see with real eyes soon. Yes – you can easily see Comet Lovejoy from Croatia. Thank you for your informative, easy to understand diagrams, showing where and when it is possible to observe items of interest in the night sky. I appreciate the ease with which I, a backyard novice, can obtain to get out there with the right equipment (if any) and enjoy the event! I don’t feel bogged down with tech-speak and yet, your site is educational nonetheless! Thank you Robin for your kind words. Nice of you to write and I’m glad you find the diagrams useful. Is Lovejoy visible in the evening sky now? It’s very low in the west at the end of evening twilight – only about 8-9 degrees high. Morning viewing is much better.